^ 2.0 2.1 2.2 Ruppert et al. (2004), pp. 628–650. ^ Mortenson, Philip B (2010) This is not a weasel: a close look at nature's most confusing terms Pages 106–109, John Wiley & Sons. ISBN 9780471273967. ^ Boßelmann, F.; P. Romanob; H. Fabritiusb; D. Raabeb; M. Epple. 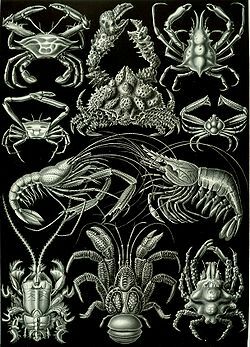 The composition of the exoskeleton of two crustacea: The American lobster Homarus americanus and the edible crab Cancer pagurus.. Thermochimica Acta. October 2007, 463 (1–2): 65–68 [14 August 2012]. doi:10.1016/j.tca.2007.07.018.